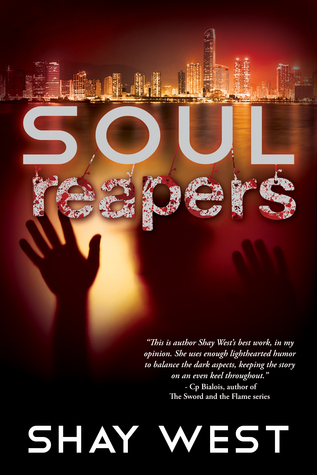 I read Organ Reapers by Shay West about a year ago, so I had to have this book. I was so glad when I heard about book two and I love that it was about Eli and Ava and their partnership. I'm not usually a fan of cop books, I just don't like the crime fighting, law books. However, I love Eli and Ava solving crimes and would read more of their stories. I love Eli and Ava, their partnership is awesome. Of course, I wish it could be more than work but I understand the no relationship because of work thing. It would be weird if they hooked up and were work partners too. I kind of felt bad for Eli when Ava was dating and he was jealous. Organ Reapers was more paranormal than this book was. Don't get me wrong this has a paranormal side to it but not until the end. So it's mostly the detective duo trying to crack this case. I felt like some chapters were kind of pointless and not needed. Other than that I had no issues with this book at all, it was great. A great thing about this book though is that it seems more real on the law side. It took them months to find all evidence they did, unlike it shows or movies where it's instant. I liked that, it made it feel more accurate to me. The epilogue sounded promising for the next book and definitely peaked my interest. I can't wait to see what Shay West has in store for Eli and Ava and Tani in the next book. I recommend this series to those that like reading law and order style books with a paranormal element.